Inspiring stories from Mitchell's Journey readers who faced their own challenges and rose above the ashes. ABOUT THE AUTHOR: Melanie Mackie is the mother of Dylan, a young boy who was diagnosed with DMD. She shares her journey living on the edge of an invisible, IMPLACABLe disease and how she coped with her son's inevitable fate and the aftermath of living without her sweet son. It was a shocker to hear the Doctor tell me I was pregnant. I never planned on being a MOM at this point in my life. I was scared but at the same time I was excited. So the nine months went by and it was time to have him come into the world and be my son. The labour was intense and to this day I wonder if he knew what was to come. I say this because he did not want to come out of me. I tried . I pushed for hours. Didn’t want out. But of course the Doctor pulled him out of me , cut the cord around his neck and hoped he would start breathing. I brought him home and totally fell in love . He learned all the normal things a toddler is taught. How to eat, talk, play, walk , and even run . He was a perfect baby . A happy baby. A very cute baby. Dylan’s third birthday came and something didn’t seem right. He was pale, constantly wanting to drink water and peeing thru his diaper A LOT. I took him to the Doctor and after some convincing to do a blood test for Diabetes the Doctor ordered one. I looked it up and read about it while waiting for the results and was hoping it was not a positive blood test. My family , Dylan, and I went out for dinner the evening the Doctor got the results. Sure enough we had to go to the hospital right away as Dylan’s blood sugar was 55. Very high and he was still alert and seemed ok. So off we went to the hospital . The nurse gave him a shot of insulin and it brought his sugar down way too fast and he started vomiting. After a week in hospital and a tonne of information in my brain we went home. This was Jan.2000 , a month after he turned 3. I have to say I really don’t know how I did it but I managed to pick this up right away and kept his sugar controlled and he started eating 6 times a day and getting needles everyday. This part he did not like for quite some time as well as the pokes to his fingers to check his sugar. This doesn’t run in my family at all and it was a big shock to us but I dealt with it because what else could I do. Now for the DMD diagnosis. Dylan got very sick with gastroenteritis (a very bad flu) and was admitted to hospital . The Doctor in the ER decided to do quite a few blood tests and one of which came back showing the liver enzymes extremely high. So at this point the Doctor thought something was wrong with his liver. We ended up going to The Hospital for Sick Children in Toronto, Ontario . Dylan had to get a liver biopsy done . This was scary for me and I didn’t like him being put under for this procedure but thankfully it was very fast. This turned out to be for nothing because it was not his liver. Dylan’s diabetes Doctor decided to ask them to do a blood test to test the muscle and sure enough they found it to be very high. 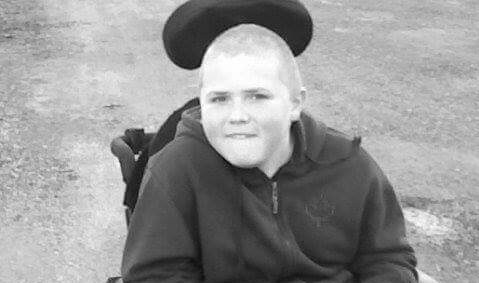 September 3 2002 , one of the worst days of my life, Dylan was diagnosed with Duchenne Muscular Dystrophy . From this day on everything changed in my life but also Dylan’s life took a sharp turn in a different direction. So now after learning how to walk he was about to learn that it was going to be taken away from him . Turns out that when a child has a life threatening ,terminal, illness then a wish can be granted . Dylan wanted to go to Disneyworld and meet Mickey Mouse. Make a Wish took care of everything. We got to go in a limo , on a plane, stay in Florida at an amazing place called Give Kids the World and go to all the parks AND have some spending money. It was the best and Dylan had a great adventure. Dylan’s decline of muscle strength was a slow process for his legs and you would think this was a good thing but it wasn’t for him. He started with a walker then to a manual wheelchair and then finally having his own independence on his movements he got an electric wheelchair. He was actually very happy to get the electric chair after a few years of struggling this was his prize. I wanted to share with you all the vehicles Dylan has been in because he is proud of all of them and loves anything with wheels. His ultimate fave is the city bus(loves riding the bus), train, plane, boat, 18 wheeler, smart car, tow truck, fire truck , ambulance, taxi, limo, jeep, pickup truck, cars, accessible race car, moving truck, ferry, school bus, steam train, snowmobile, go-kart, pontoon, police car, coach bus, zoo-mobile, hay ride , riding lawn mower trailer, golf cart, ATV, mono-rail, subway, two accessible vans and a convertible. At this time Dylan’s heart is being damaged by Duchenne. It is pumping and working so hard to keep him going. This disease is evil and I sure hope a cure can be found to help these kids not have to go thru this. He doesn’t know he is dying and I will remain positive and fight the fight as long as possible for him. He will laugh right up until the time because he is so innocent and his personality makes him shine. At this time it is very exhausting and emotional for me but it has to be done for my son. He needs me right now and I will not leave his side. I will continue to pray for a cure but I’m afraid it will be too late for my Dylan. Listen to the remarkable words of a young boy with DMD who describes what he would do if he could walk again. ABOUT the author: karalee & Austin is a mother and son who face the daily challenges of a catstrophic muscle wasting disease, DMD. These are some of the memorable one liners I have heard over the past seven years of mothering Desi. And there are more. And then there are the meetings I get to have with principals and babysitters and local rescue departments and playdates to prepare those around him for what will hopefully never happen, all the while smiling and trying not to scare anyone away from him. And there are the emergency room visits where I know more about my son’s medical conditions than those caring for him. ABOUT THE AUTHOR: Carly is a mother of three whose son faced an undiagnosed, life-threatening illness. But then there is the National Institutes of Health and the researchers and clinicians there who are so wicked smart and attuned to cases like Desi’s, who are willing to tell me that they don’t know what is wrong, but not to give up. And within the NIH is my son’s version of Disney World: The Children’s Inn, where his face lights up when he walks into the lobby and searches his mailbox to see what prizes have been left for his discovery. Where he walks around like a king, narrating his way through the playrooms and kitchens, stuffing donuts in his mouth and flopping on the bed in our room. Where he is so proud to be amongst the bravest of the brave. Where he learned first hand why we can’t stare at kids who are outwardly different. Where he played with an 8-year-old little boy whose mother was told he wouldn’t make it to 10. You see, Desi gets it. He knows more than a 7-and-3-quarters little boy should know. He knows to ask for something to squeeze as they take 30 vials of blood, boasting to the phlebotomist that he doesn’t cry when he gets his weekly injections from mom. The Inn is his other home. It is where he feels part of. Where even though he doesn’t look like one of the “sick kids” he still knows what it feels like to be one of them. And what Desi is most proud of right now is his mom, because she, yes I, have pledged to run the Marine Corps 10k on The Children’s Inn team, a race to raise money and awareness for families that come from all over to stay at the Inn while they walk the long halls searching for answers. If you want to show support please consider donating. All proceeds directly benefit families and children who show up afraid and barely holding on to hope and provide a safe harbor as they sail through the storms. Click here to help out. The Children’s Inn at NIH provides free lodging—and so much more—to over 1,500 children that stay there each year while participating in clinical trials at the National Institutes of Health (NIH), the nation’s premier biomedical research institute. Each mile and each dollar raised from Team #RunINN4Kids fuels access to the research that makes childhood possible for the more than 13,000 kids, traveling from all 50 states and 94 different countries, who have stayed at The Inn. The Inn provides not only free lodging, but also meals, more than 1,300 hours of educational, recreational and therapeutic programming each year—things like homework help, field trips to the monuments in DC and even summer camp for children that could never otherwise attend—all while enabling families to develop friendships and learn from others who know what it’s like to seek the promise of hope or a cure for a seriously ill child. I have decided that I am going to send a message each day, for a year, to someone who has crossed my path and made my life brighter. Today it’s you. And just like you did, 4 years ago, you show up exactly when I need you. I used this picture, because this is the picture I remember seeing the first time I read about you. I was in the car, feeling really low and lost and almost hopeless. My son was really sick and I am usually really optimistic, but we were struggling. And then you came crashing into my life. Your father, as you know, has a gift with words and the very first post I saw was the day you passed away. I sat in my car and had a spiritual experience. I cried and cried and scrolled all the way down to your dad's first post and read the entire day. And you changed my life. You gave me perspective and gratitude and reminders and heartache and love. As I would sit, in the ER, with Desi burning up on my chest, with no one knowing what was going on, I searched for your father's latest post to get my dose of gratitude. That fall I sent your father an email telling him how much his posts and your story meant to me. I never heard back, but I hadn't sent him the letter to hear back. He has over 250,000 followers (that's how special you are!) But then one day, I got an email from him telling me how much my email meant to him and he asked me if I would be willing to have a film crew come to Cleveland and interview me and our family about the impact you had on us. It was one of the greatest honors of my life. The documentary aired and my entire world changed. You and your father brought people into my life that I would never have known about. There is never a day I do not think of you. I run with your name on my chest, I climb with you in my heart and we lit a candle in your honor at my wedding. Thank you for all you have given to this world. Thank you for reminding me what really matters and thank you for having such a beautiful family who is willing to share your light with all of us. I am forever changed because of you. Meet Marco Simmons, a remarkable young man who has faced incredible odds in his life and with the loving support of his adopted family, rose above the ashes and began a journey of courage and strength that would touch the hearts of thousands of young boys with DMD. This isn't his story - but a preview to his story that we'll share here and in a final documentary in the months to come.